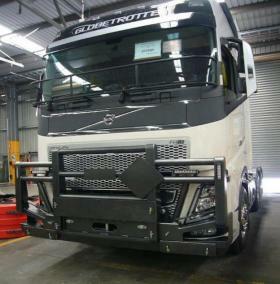 Volvo FH16 Hi-tensile polished Aluminium Roadtrain FUPS Bullbar, 76mm tube with 6mm thick wall plus four centre box uprights for maximum cab protection. Custom driving light mounts and indicator repeaters mounted in external box uprights. 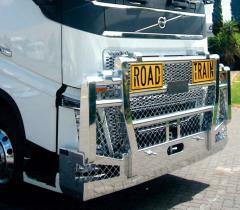 Flip over Road Train sign on polished alluminium plate. Heavy duty hi-tensile aluminium backing plate with tow pin. Additional roo cutters and heavy duty mesh for maximum protection plus provision for radar. Volvo FH16 Hi-tensile 6 Post Heavy Duty Aluminium Roadtrain FUPS Bullbar, 76mm tube with 6mm thick wall for maximum cab protection. Radar compatable. Custom driving light mounts and indicator repeater/daylight running lights mounted in the external box uprights. Flip over Road Train sign on alluminium plates. two sets of Roo slicers. Heavy duty mesh protects the driving lights and lower Fog lights. Heavy duty hi-tensile aluminium backing plate with dual tow pins. Volvo FH16 Hi-tensile 6 Post Heavy Duty Aluminium Roadtrain FUPS Bullbar, 76mm tube with 6mm thick wall for maximum cab protection. Radar compatable. Custom driving light mounts and indicator repeater/daylight running lights mounted in the external box uprights. Flip over Road Train sign on alluminium plates. Roo slicers and extra small lower pipe extensions for maximum headlight protection. Heavy duty mesh protects the lower Fog and Spot lights. Heavy duty hi-tensile aluminium backing plate with dual tow pins. 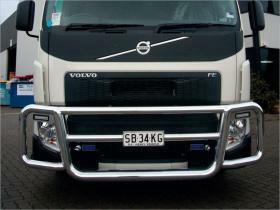 Series 4 FM FH Volvo FUPS bullbar for Wild Bar style suitable for radar attachments. 6mm hi-tensile 6mm wall tube with heavy duty uprights, contoured to compliment the new cab shape. Hi-tensile aluminium backing plate, same tensile strength as steel. 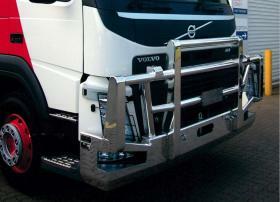 FH series Volvo,.FUPS compliant hi-tensile aluminium bullbar. This style is only 138KG with Hi-tensile aluminium backing plate. Radar compatible. 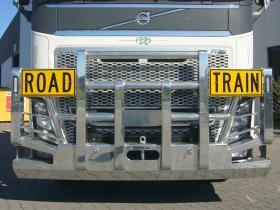 Optional security mesh over headlights & removeable road train signs shown. Driving light mounts to customer requirements. 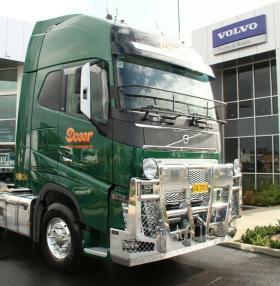 Volvo Series 4 Hi-tensile 6 Post Heavy Duty Aluminium Roadtrain FUPS Bullbar, 76mm tube with 6mm thick wall for maximum cab protection. Custom driving light mounts to customer requirements and combination indicator repeater/daylight running lights mounted in the external box uprights. Flip over Road Train sign on alluminium plates. Roo slicers and extra small lower pipe extensions for maximum headlight protection. Heavy duty hi-tensile aluminium backing plate with 38mm centre tow pin. 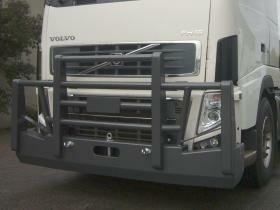 FH series Volvo heavy duty FUPS hi-tensile aluminium bull bar. 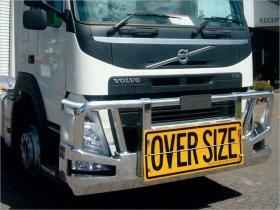 Optional heavy duty mesh over whole of bull bar & road train signs shown. Optional square spotlight mounts. Steel tow pin mounted in heavy duty high tensile aluminium backing plate. Volvo FH16 Hi-tensile Heavy Duty Aluminium Roadtrain FUPS compliant Bullbar, 76mm tube with 6mm thick wall for maximum cab protection. Collision Avoidance System (Radar) compatable. Custom driving light mounts and indicator repeater/daylight running lights mounted in the external box uprights. 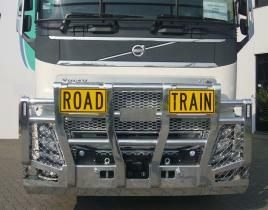 Flip over Road Train signs on alluminium plates. Dual Roo slicers and extra small lower pipe extensions for maximum headlight protection. Heavy duty hi-tensile aluminium backing plate with dual tow pins. Volvo FH16 Hi-tensile 6 Post Heavy Duty Aluminium Roadtrain FUPS Bullbar, 76mm tube with 6mm thick wall for maximum cab protection. Radar compatable. Custom driving light mounts and indicator repeater/daylight running lights mounted in the external box uprights. 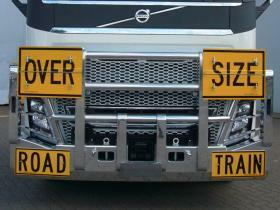 Flip over Road Train & Long Vehicle signs on alluminium plates plus fold down Over Size signs. Roo slicers and extra small lower pipe extensions for maximum headlight protection. . Heavy duty hi-tensile aluminium backing plate with dual tow pins. 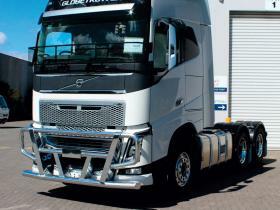 Volvo FH16 Hi-tensile FUPS Bullbar, 76mm tube with 6mm thick wall for maximum cab protection. Additional uprights to lower bar for extra protection. Collision avoidance System compatible. Indicator repeater lights included & custom driving light mounts as required. Provsion for Dangerous Goods sign on alluminium plate. Heavy duty hi-tensile aluminium backing plate. Optional tow pin on customer request. 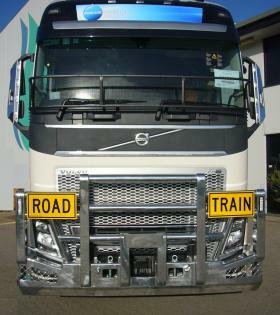 Volvo high tensile aluminium FUPS "Wild" bull bar, suit radar fitted trucks. 76mm tubing. Custom driving light mounts to suit application. Lightweight with maximum protection. Indicator repeater lights in uprights. 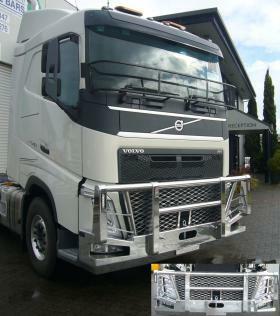 FH series Volvo heavy duty radar compatible FUPS hi-tensile aluminium bull bar. Features 160mm deep skirt and 76mm heavy duty wall tube. Heavy duty mesh in front of the grill and channell to protect lower lights. Flip over aluminium Road Train signs shown. Optional spotlight mounts as requires. Dual steel tow pins mounted in heavy duty high tensile aluminium backing plate. Dual Roo-cutters to protect headlights. Indicator repeaters in outer box uprights. 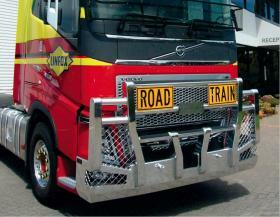 FE Series Volvo FUPS compliant bullbar with Wild Bar styling contoured hi-tensile aluminium pipe with 6mm thick wall. Indicator lights are mounted under the upper bar. 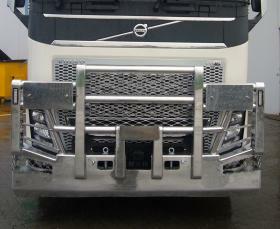 FH-FM series Volvo heavy duty FUPS hi-tensile aluminium bull bar. Optional square spotlight mounts. Steel tow pin mounted in heavy duty aluminium backing plate. One piece upper tube passes through drilled centre uprights and is recessed into the outer uprights, no but welds. 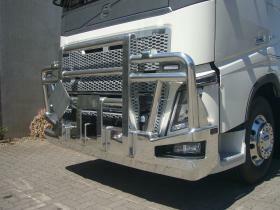 FH-FMseries Volvo heavy duty FUPS hi-tensile low profile aluminium bull bar. The low profile allows for the grill to beopened to carry out daily checks without dropping the bullbar. 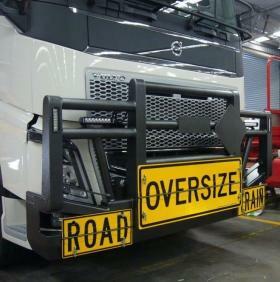 Optional mesh over whole of bull bar & Road Train signs not shown. Mesh fitted in front of grill and roo-cutters in the front of the headlights for maximum protection. 76mm heavy wall tube. Indicator repeaters recessed into outer uprights. 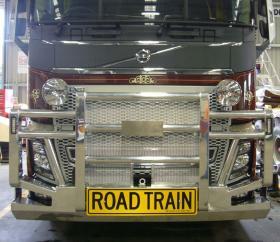 Heavy duty contoured lower skirt to main bar.Steel tow pin mounted in heavy duty high tensile aluminium backing plate. Volvo FH Globetrotter Hi-tensile Powder Coated Aluminium Roadtrain FUPS Bullbar, 80mm tube with 6mm thick wall for maximum cab protection. Custom driving light mounts and indicator repeaters mounted in external box uprights. 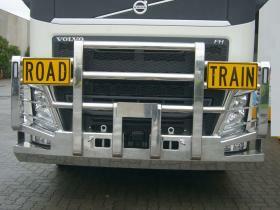 Fold down Road Train sign on alluminium plate plus fold down Oversize signs. Heavy duty hi-tensile aluminium backing plate with tow pin which is easy to access without removing signs. Provision for Dangerous Goods sign. Volvo FH Series 3 Hi-tensile Powder Coated Aluminium Roadtrain FUPS Bullbar, 76mm tube with 6mm thick wall for maximum cab protection. Custom driving light mounts and indicator repeaters mounted in external box uprights can be fitted on request. Heavy duty hi-tensile aluminium backing plate with tow pin which is easy to access without removing signs. FM-FH Series Volvo hi-tensile aluminium FUPS bullbar with 2 low upright styling allowing cab panel to open to check for water levels. Optional hinged Oversize sign shown. Significant reinforcing on bent corner pipe into structure of bull bar channel on this model. Driving light mounts to customer specification. Heavy duty hi-tensile aluminium backing plate and tow pin.